The START DATE for The Border Quilt Quilt Along has been changed to September 15th so you will be able to use the same fabric as Jen is using (Enchanted Forest Flannel). BONUS: You have more time to enjoy summer and leisurely prepare for the Quilt Along! And I have a bit more time to work on my Fall Class Samples. My blog post about my fabric choices was already set to go so I'm sticking with it. See the fabrics I'm going to use below. Have you signed up for The Border Quilt Quilt Along? This is a pattern designed by Patterns by Jen and I joined in as soon as I saw the quilt. Read my previous post about why I wanted to make this quilt and see how you can join the fun too! Today I am sharing the fabrics I will be using for my quilt. While I love the flannel that Jen's using I thought it would be fun to change up the quilt to make mine a bit unique. First, I decided I would 'swap the values'. So where Jen is using light fabrics I'll be using dark fabrics. I think my quilt will be a bit dramatic! I'm in love with Banyan Batik fabrics and there so many wonderful colours in their amazing 'basic' collections called Ketan Multi, Ketan and Shadows. Here is a picture of my fabric choices from those collections. 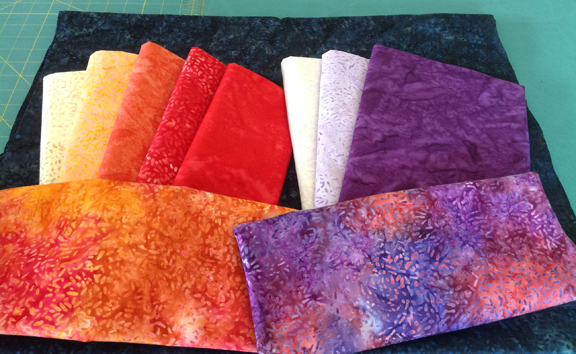 I started with the 2 Ketan Multi fabrics and selected the rest of the palette based on those colours. Click the button below to learn more about The Border Quilt Quilt Along. I hope you'll join the Facebook Group where you can share your progress! Now that I have my fabrics I will be working on the center part of my quilt. I'll be posting my results around August 15th New Date: September 15th so be sure to check back then. I'll be sharing in the Facebook Group and on the Patchworks Studio Facebook page too.